I am a cheese whore. This is the premiere time of year to indulge my passion for cheese. While cheese can be shipped anytime of year, winter is the season to make your move. The shipping charges are reduced because cheese producers can ship it slower and cheaper without having to add freezer packs to maintain the integrity of the cheese. These are the cheeses that have added to my mass this month. 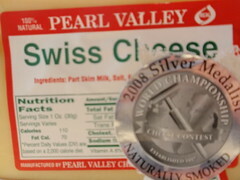 Pearl Valley Cheese was awarded the Silver Medal for their Smoked Swiss Cheese at the World Championship Cheese Contest in Madison Wisconsin. This was my favorite of the seven Pearl Valley cheeses I sampled. Steiner has won many awards as well. If shipping is not your thing, they have added a retail store in Zanesville. If you are passing by on I 70 during the holidays – the store might be an alternative to a rest stop. If you do make a detour, I would suggest you visit Tom’s Ice Cream Bowl and Donald’s Donuts. If you opt to visit their store in Amish country take a look around, it is the oldest cheese factory (1833) in the country. Aged Swiss is my favorite. 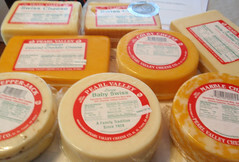 Ok, Carr Valley is in Wisconsin, but I discovered the cheese in Granville. Their Baa Baa Blue is the second best Blue cheese on the planet. (The best is Whitestone Windsor Blue from New Zealand). 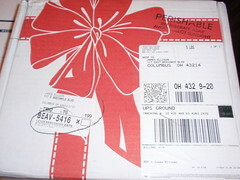 Ordering Pearl and Steiner cheeses by mail order can provide some really good deals – even with shipping factored in. Carr Valley is pricey, but shipping is a bit lower this time of year. 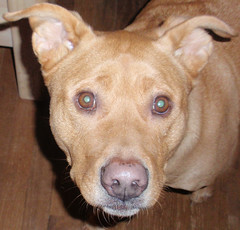 I also cross checked my cheese chomping choices with my chief CMH Gourmand taster, Toby. He agrees with my picks. This entry was posted on December 25, 2008 at 8:49 AM	and is filed under cheese. Tagged: Pearl Valley Cheese, Steiner Cheese. You can follow any responses to this entry through the RSS 2.0 feed. You can leave a response, or trackback from your own site. I went to college in New Wilmington, PA which is across the border from Youngstown. There is a small Amish settlement around there. There were always buggies coming into New Wilmington and the little stores kept some Amish souvenirs. The local restaurant served small sticky buns with meals which were remembered fondly by many familes.